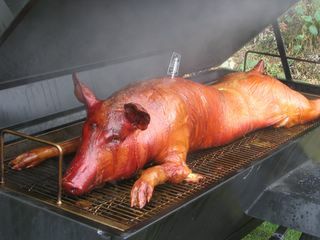 This weekend some good friends invited me to a pig roast in New Hampshire. This was my first experience with whole roast pig. They got a pastured St. Johnsbury pig, which was $1.25 less per pound than the Tamsworth, and was also, according to the butcher, better. I couldn't decide and feel that a side by side tasting is required. Maybe today. Mostly, I just want to eat more pork. 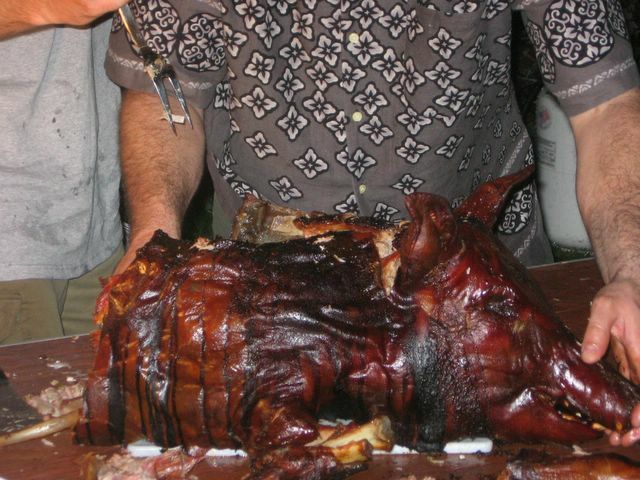 My god, was that pig good. It was stuffed with apples and basted with a mixture that included hot sauce, mustard, cider, and a few other things. The fat rendered down to nothing; the fatback was thin and crisp and delicious. I love Italian families. People really eat. I hate parties where people don't eat. I've been tagged for a meme! I'm a real blogger! This is very exciting. I've actually been tagged for a meme, like the real bloggers. Thanks, Haverchuk! 1) Blackberry picking. In my adulthood, I have come to understand that not everyone considers berry-picking a basic family activity, like going to the beach. But my mother grew up on a farm, and my father could never resist anything free, so beryy-picking was a big thing for my family. Our mainstay, berrywise, was blackberries. A small patch of blackberries grew behind my grandmother's house, so we could always get a few there, but the serious picking happened on state land under the pylons. We were suburbanites to the core, but we always knew which little patches of public land held blackberries. To protect from scratches, we would dress in jeans and flannel shirts despite the heat of summer, and we would spend hours picking bucketsful of berries, which my mother would make into jam and pies. The best and biggest blackberries, as any picker knows, grow deep in the brambles. After getting covered in scratches maneuvering to the center of the patch, I would be rewarded with perfect berries hot from the sun. One day we picked 18 gallons. I live in the city now, and I can't bring myself to pay 4 dollars for a tiny box of flavorless blackberries, so I lead a sad, berry-free life. 2) Grandma W.'s biscuits. Grandma W. wasn't much of a cook. She served the same meal for pretty much every Sunday dinner - eihter roast beef or ham, with green beans, potatoes (usually scalloped), piccalilli, a simple salad of lettuce and tomato, and biscuits, with very dry brownies and coffee ice cream for dessert. Not a bad meal, and not badly prepared except for the brownies, but joylessly unchanging and served in neat, somewhat stingy portions. But those biscuits represented my Platonic ideal of biscuit. Not the high, fluffy biscuits promised by many recipes, these were almost dense and very flaky. The closest I've come to matching them has been with the recipe on the back of the Bakewell cream can. In her later years, she would give me some of the leftovers to have the next day, and I would eat them the next day with slices of cheddar cheese and butter. 3) If I have a Grandma W. memory, I should really have a Grandma J. memory, because that woman could really cook. I found out after she died that she had worked as a cook for the Mayor of Lowell in her younger years. Meals at her house were the polar opposite of Grandma W.'s - piles of food, sometimes two types of roast, all sorts of vegetables from her big garden, lots of the quickbreads the New England cook adore, big unfrosted sheet cakes, handsome pies. Her cooking was simple, in the Yankee/Canadian maritime tradition. But it was all good. My strongest recollection of food from her house, though, is not the food itself, but the smell. My grandfather believed in a real breakfast of eggs and bacon and toast. (Cereal was a addition, not a replacement, and it was served with cream, not milk.) I can't imagine that the coffee was very good, because she sometimes used a percolater and sometimes boiled the coffee in an open pot, cowboy style, with an eggshell. Those methods, bad as they may have been for the coffee, make the whole house smell wonderful. Add in the smell of bacon. Then add a touch of the sawdust smell from my grandfather's basement workroom. I come upon that particular combination of smells sometimes, particularly in country stores that serve breakfast, and it always makes me feel seven years old. 4) God, I hope my mother never reads this. My mother is, well, a terrible cook. So any honest list of memories from my childhood has to include something borderline inedible. I guess the most appropriate choice would be liver. My mother believed firmly that children needed liver at least once a month for iron. She cooked liver like she cooked steak - a little water in the frying pan to keep the meat from sticking, then a nice long cook on each side, until the meat was gray all through. Note: no oil, no seasonings. I think that the liver was often served with onions, and I'm not sure how she made those. Also steamed? Or did she pull out the rarely used bottle of Crisco oil? At any rate, the kids weren't required to eat the onions, but we did have to eat our liver. I haven't touched it in years, though I love pate and liverwurst. I just shudder to remember liver night. 5) Baking. My mother was a much better baker than she was a cook, and she was very good about teaching me how to read recipes, measure, and so on. She was allowed me full freedom in the kitchen from a very young age, for which I am deeply grateful. My failures made the strongest memories, not surprisingly - blackened cream puffs that didn't puff, a tragic attempt to make fondant, and the Baked Alaska I tried to make on a very hot day that my family called "Baked Disaster." But I had successes, too, and I loved the process of baking, putting on the apron, finding a recipe in Fannie Farmer, measuring the flour, mixing the batter. If I had to pick a single dish as a locus of memory, I would choose gingerbread, which I made often and still do and which feels more comforting than any other food. I have a confession to make. I don't really care about most fruit ice creams. I love blueberry ice cream made with real wild Maine blueberries, and I like orange ice cream, and other than that, I would rather mix my fruit and ice cream by putting ice cream on my pie. Peach ice cream? I don't hate it, don't get me wrong. I'll eat it if it's served to me, but I'll never order it. I generally tend toward the nutty flavors (hazelnut, pistachio, maple walnut, butter pecan), the austere dairy flavors (buttermilk, sweet cream), and the chocolate chip family (plain, mint, coffee). Of course, by all rights, anyone with a blog sporting the name "Seasonal Cook" should be making peach ice cream right now. Maybe plum. There are still blueberries at the farmers' markets, though they are generally the big, cultivated berries. But since the orange-tinged ricotta business, I've been obsesses with orange ice cream. Actually, more accurately, I've been obsessed with orange/ginger ice cream. Orange and ginger is one of my favorite flavor combinations. I like it spicy hot in Chinese food, I like it bitter/sweet in marmalade, and I like it plain old sweet in biscotti. I love both orange and ginger ice creams, so the two together had to be great, right? But I had a moment of terrible shame when I was standing in line at the checkout counter with my oranges. I looked at the annoying little stickers the grocery stores always put on the produce and they read "South Africa." My oranges had been shipped halfway around the world. This is exactly what the Seasonal Cook is completely against. And in the middle of the harvest season no less! Juice and shredded rind of two large oranges. I simmered the juice of the oranges with 1/4 cup sugar, 1/2 the rind, and the ginger until it was reduced to a syrup. I let that cool a little, then strained. 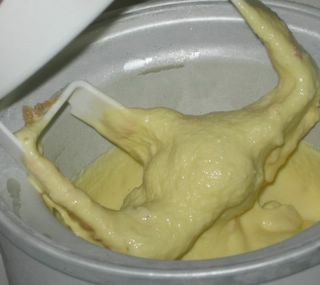 Then I heated the cream and milk together, whisked together the rest of the sugar and the yolks until light, poured the milk/cream mixture over, return to the heat, cooked to the custard point, removed from the heat, mixed in the orange/ginger syrup and the orange rind. Then I chilled the mix for a few hours before putting it in the ice cream maker. I added the chopped candied ginger a minute or two before the freezing was done. The one complaint I have about the frozen-canister-style ice cream makers is that the canisters can melt too quickly on really hot days. I would usually freeze the mix a bit more before transferring to the freezer, but it was 100 degrees in my kitchen and that machine wasn't going to freeze that ice cre4am one bit more than it already had. Besides, I would rather err on the side of beating too little air into the ice cream (low overrun) than risk beating in too much (high overrun). Candied ginger is great in ice cream; it doesn't freeze too hard, which one might expect. I use a lot of eggs in my ice cream. Apparently, there are people in the world who worry about ice cream being too "eggy." I am unable to speak to this, as I consider "too eggy" to be as weird a concept as "too buttery." The eggs give a very rich mouthfeel, incredibly smooth. According to Liddell, the French in general favor richness and smoothness in ice cream, while the Italians prefer intensity of flavor, and the Americans sweetness. I am all with the French here - a good gelato is great, but I will sacrifice some flavor for mouthfeel, which is why I prefer ice cream to sorbet. Also, homemade ice cream with lots of eggs keeps a good texture longer. After three days, my ice cream still isn't icy. I think that balance of orange and ginger in this ice cream is pretty good, but the orange was too strong the first night. The next day, everything had balanced out. Not sure why. 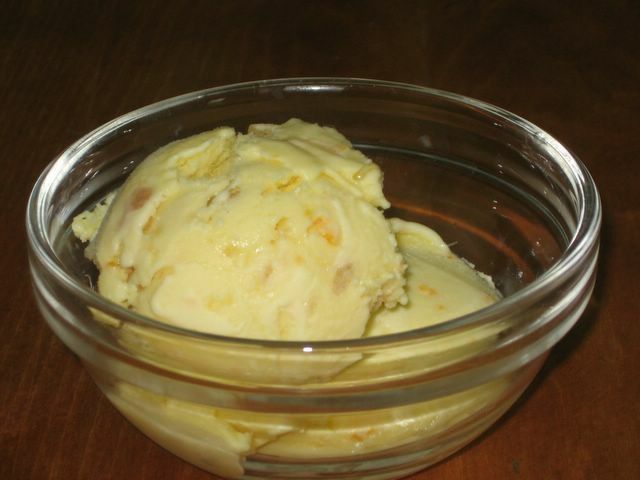 If you like to eat your ice cream right away, you might use less orange zest and increase to a "big old chunk" of ginger. No new posts, really, in about two weeks. But I've been a good home cook. This weekend my landlord finally replaced my ancient and ailing fridge, and so I did some freezer cleanout in preparation. I made both chicken and beef stocks. For the chicken stock, I used the bits of parsley, onion, and carrot I had kept in a bag in the freezer for that purpose, plus of course chicken backs (both from cutting up whole chickens for parts, which I am kicking myself for not having started to do sooner, and from Whole Foods, which occasionally sells packages of backs for stock very cheaply) and a couple of carcasses from roasts. Many, many hours of cooking later (I used a crockpot overnight), I was rewarded for my hoarding of bits with really beautiful, deep yellow, rich stock. Oh, I also followed Sally Fallon's advice, and included a spoonful of white vinegar in the pot. You can't taste it, but she claims the acidity helps to leach the calcium from the bone, making the stock more nutritious. Can't hurt. I believe deeply, by the way, that one of the weaknesses of the American diet is its lack of bone-based stocks, which are full of minerals. There's a reason recovering invalids used to be given mugs of hot beef bouillion or bowls real chicken soup. The broth-based canned versions most American eat don't stack up nutritionally or, of course, culinarily. For the beef stock, I roasted the bones in the oven first until browned, then simmered them in water for hours. I cooled the stock, and left it overnight in the fridge. In the morning, I removed the fat from the top and stored it in the freezer, returned the gelatinous stock to the stove, and added a meaty shank for beef flavor. I cooked it a few hours more. The stock tasted meaty and gelled up completely. But the color was lacking, just a pale, greyish-brown. If anyone knows how to get my stock prettier, please post a comment. I also cooked a lot of vegetables this weekend. I tried callaloo for the first time, having picked some up at the Brookline Farmers' Market. This green takes a while to prep, because the stalks are large and branchy. But the flavor is worth it, very much like spinach, but a bit deeper and more resonant, not at all bitter. I cooked it with garlic and red pepper, then tossed it with some pasta and ricotta salata. Excellent. I also made green beans and roasted potatoes with a basil-walnut pesto, which I liked quite a bit. I highly recommend the use of walnuts in the pesto for use with green beans; there's just something about the bean and walnut combination. Georgian cuisine uses that pairing frequently, and the results are fantastic. I also made stuffed summer squash and green peppers for about the tenth time this summer. I seem to be caught in a rut. But the stuffing this time was the best so far: ground beef; homemade, rough, dried bread crumbs (bigger than crumbs, but smaller than croutons), shredded yellow summer squash; fresh corn; chopped parsley; garlic; and a touch of onion, plus dried oregano, paprika, white and black peppers, and salt. The corn added a lot to the texture and the flavor, while the shredded squash kept the mix light and moist. I'm sticking with this version. Normally after the weekend I have someting to post, Saturday being the best day to get some real cooking done. But ye gods was it hot this weekend. Too hot to cook. Too hot to move. I boiled corn and that was about it for the application of heat to food. Otherwise, this weekend was all about raw fruit, yogurt, tomatoes, ice cream, and lying very, very still on the couch. But it's much cooler now; maybe I'll get something done tonight. I want to talk about jam, but first I want to talk about culinary failure. Reading many food writers can leave you with a sense of unworthiness. Everything they make sounds so good. Everything they eat is beautiful, nutritious, fresh and perfectly cooked. It's irritating. Food blogs provide a nice corrective to traditional food writing. Regular people who describe the regular cooking in their lives write about overcooked meals, undercooked meals, fallen cakes, undersalted meat, dull soups. I have made all of these and more. Usually, at this point in my life, I can be fairly confident that anything I cook will be pretty good. (My early twenties, on the other hand, were a pretty sketchy time, culinarily speaking.) Sometimes, I achieve excellence. Maybe once a year I achieve transcendence. Sometimes, my food is edible, but not what you would call good. Sometimes, I fail utterly. I love making jam, and I've had a lot of success with it. Jam isn't hard, just a bit fussy. Lots of prep, lots of time, but the end product is pretty much assured as long as the fruit is good. This summer I've had a hard time finding good fruit. One week I bought two quart baskets of strawberries from the same vendor who had sold me delicious strawberries the week before. The strawberries were flavorless. I sliced them, sugar them, doused them in Grand Marnier and ate them up. I was not going to waste the time to make jam out of lackluster berries, even if my very best jam of the year before had been strawberry with black pepper and balsamic vinegar, and I was dying for some more. I've been itching to start making jam, so when I saw tiny red plums at the farmer's market, I figured the time had come. Plums like this inspire jam sessions. I bought two baskets, which turned out to be less than the amount required for Christine Ferbinger's plum jam recipe, so I cut it down by a third. Her recipes are for small batches to begin with, so I was really taking on a lot of work for a tiny amount of jam, but I persisted. 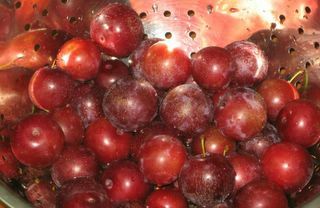 I cut the plums in half and removed their pits, then combined them with the sugar and lemon juice and let them sit for an hour. Then everything got brought to a boil, taken off the heat immediately, and allowed to sit overnight. This is a pretty standard method for good jam. The fruit starts to absorb the syrup before the final cooking. You're minimizing the amount of time the fruit is actually cooking. The next night, I strained the juice into my beautiful, Kitchens Etc.-closing-sale-bargain, wide copper preserving pan, reserving the fruit to the side. I brought the juices to a boil. And here's where the failure part kicks in. You see, there are two major methods people use to check whether a syrup has reached the jellying stage. The first is the homey, old-fashioned method: you chill a stack of saucers, remove one, put a bit of the syrup on it, wait a minute for it to cool, and tip it up. If the syrup runs like, well, syrup, it's not done. If it rolls down the saucer sluggishly, thickly, if you can run a finger through it and the line stays clean, then you've got jelly. I have used this method successfully for making jam for about ten years now, at least four or five batches a summer. Then there's the candy thermometer method. It's easy, just check the temperature with a thermometer. Gadgets are nice, aren't they? A number seems so much more legitimate than a saucer dripped with syrup. A thermometer seems so scientific, so precise. Also, the saucer method? You have to use a clean, cold saucer for each test. That's a stack of saucers to clean up afterwards. So I was lazy and only used the thermometer. The syrup had only boiled a minute or two before I figured I would take a baseline temperature measure. The little red line kept rising and rising, until it shot past the aimed-for temp. I panicked. How could it have gotten so hot so fast? The syrup didn't even look thickened yet. Ah, but it was a tiny batch in a big pan - evaporation had clearly happened very quickly. Overcooked jam is worse than undercooked. I added the fruit, let everything return to a boil, boiled five minutes as instructed, then processed. Cooking the jam, round one. The processing is the part that makes jam-making a bit of a hassle. You have to wash the jars, then boil the jars, scald the lids, fill the jars, wipe the edges of the jars very carefully, put the lids on, put the jars back in the boiling water, boil ten minutes, then remove them. Your reward is the incredibly satisfying popping noise each jar makes as, cooling on the counter, it seals. So I processed 5 tiny 4 oz jars and 1 smallish 8 oz jar of jam and went to bed most pleased with myself. I woke up and went immediately to the kitchen, because when you've made jam the night before, you have to inspect your jars first thing, and put the labels on, and hold them up to the light, and admire them endlessly. Except that when I held a jar up, it sloshed. 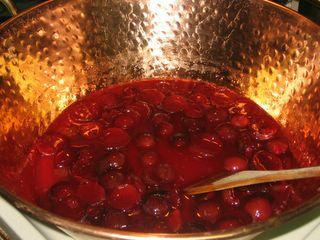 I had made red plum halves in syrup. The only other complete failure I've had jam-making was also red plum, so now I'm very suspicious of plum jams and don't intend to be making them in the future. But I still had jars of red plums in syrup, and frankly that's useless. Red raspberry syrup is fine, or blueberries in syrup, but what the heck am I going to do with red plums in syrup? So I screwed up my resolve and when I got home last night, I emptied the jars into the strainer, recooked the syrup, added the fruit back in, and actually ended up with jam. I was too irritated to go through the whole processing business, though, so I scalded two big jars and just put the jam in the fridge. Instead of cute little jars for giftgiving, I've got my own personal plum jam stash for flavoring yogurt and spreading on toast. Not bad, really, except plum isn't really my favorite jam flavor. Sigh. But at least I saved the fruit. I had lunch at Dave's Fresh Pasta in Somerville this weekend (and as an aside, the sandwich with prosciutto and fig spread was amazing), and while I was there I picked up some ricotta for making ice cream. I had come across a ricotta ice cream recipe a few month ago, and I was intrigued. I have a soft spot for all things dairy, especially cold sweet things in which the dairy flavor dominates. I love buttermilk ice cream and sweet cream ice cream and clotted cream ice cream. I love buttermilk sherbet and yogurt sherbet - not the almost-ice-cream-but-not-quite fro-yo that people order to pay lip service to their diets, but a tangy frozen combination of yogurt, lemon juice and sugar. So how could I miss with ricotta ice cream? I found a couple recipes online, all of which contained ricotta, honey, sugar and a bit of water. Some contained up to a cup of water, some just a couple tablespoons. Those recipes that only used a little water included cream as well. I mixed the sugar with the 2T juice and peel and heated until the sugar dissolved, then let that mixture cool before throwing it in the blender with the rest of the ingredients. When everything was well-whirred, I froze the mix in my ice-cream maker. And the results? The flavor was great, the cheese and orange balanced perfectly. But the texture took some getting used to. This was definitely not ice cream in the usual sense. It was dense, a bit grainy, the tiniest bit icy. The texture was, quite frankly, exactly what you would expect frozen ricotta to be, if the words "ice cream" at the top of the recipe hadn't blinded you to the fact that no blender is going to completely liquefy curds. My boyfriend said it was good if you didn't call it ice cream, and, though at first I disagreed, I'm coming around to his way of thinking. By the second dish, the texture didn't bother me, and by the third, I actually rather liked it. From someone who tends to be narrow-minded about ice-cream-type products texturally (don't like granitas much or icey eggless ice creams), that's actually saying something. So I give the ricotta ice cream a B+ (a real B+ from the old days before grade-inflation), maybe even an A-, and recommend it to those who want to try something different. But definitely give your dessert a chance and call it "Frozen Ricotta Cream." I just finished reading Reclaiming the Commons, by Brian Donahue, and I want to recommend it. This book is both a study of a community farm in Weston, Massachusetts and a blueprint for the development of community farms and managed forests for the future. The book would probably appeal most strongly to New Englanders, as he develops his discussion with historical information about agricultural in New England, specifics about the New England ecosystems, and so on. But I think anyone who is interested in local farming could get something from his very practical approach. The section on forestry is particularly well done. Check it out. Proof that the world maintains its own balance - this weekend was a culinary near-washout, which I guess is only fair given the splendors of last weekend. Friday night I made Nigella Lawson's watermelon salad (watermelon, lime juice, black olives, feta, mint, parsley and red onion), which was great, and a fine steak from my stash, which survived my overcooking with some flavor intact. I always screw up great steaks. Sigh. Then I spent to weekend at a friend's house, so lots of pleasant, but not noteworthy, suburban barbecue fare. I returned to a fridge full of limp vegetables. Now is the time to confess the dark side of the CSA program. A farm share is a commitment. If you go away for the weekend, if you get a hankering for pizza out Friday and Chinese buffet Saturday and someone invites you for dinner Sunday, if you work late every night for a week, the vegetables will still be there, slowly rotting, reproaching you every time you open the door for a beer or some leftover chow mein. Every lunch hour cheese sandwich will feel like a failure when you know there are salad makings slowly turning inedible in your fridge. Be warned. What is usually needed in the case of produce neglect is a big cook-up, a ratatouille or vegetable soup or something that will enlongate the lifespan of your vegetables, and possibly fill up your freexer. This, of course, also requires a night of cooking. After a weekend of carousing, I would rather rent some episodes of Six Feet Under and collapse on the couch with the cats, so a hefty dose of guilt is needed to force me into the kitchen. Thank the gods I was raised Catholic and have guilt to spare. So last night I made a great big salad for today's lunch, and I also baked calzones. Calzones are actually a good weekday cooking choice. The Shaw's down the street sells an acceptable pizza dough with ingredients that are readily identifable as the makings of pizza dough (flour, water, salt, yeast, shortening). On the weekend, I would make the dough myself, but we're competing with Ruth, David, Brenda and Claire here, so we're making things easy for ourselves. I made two fillings. First I mixed some grated Parm and black pepper into some ricotta and put it aside. Then I sauteed some onions, put half aside. To the other half I added some steamed spinach and chopped dried-and-reconstituted wild mushrooms, plus thyme, oregano and pepper flakes, cooked a few minutes more. Mixed that with half of the ricotta misture, and that was one filling. Then I sauteed some sliced yellow squash, added that and the rest of the onions to the rest of the ricotta mix, along with a bit of chopped sundried tomato and the rescuable part of a bunch of basil on its last legs. That was filling number two. The dough had come to room temp by this point, so I made the calzones and threw them in the oven, then made a basic tomato sauce with some garlic and a can of tomatoes, a few spices, some olive oil. I ended up with six enormous calzones, enough for dinner and two lunches for both my boyfriend and myself. Calzones are a great way of using things up, because they will take just about any filling. A bit of ham or sausage would have been nice if I had any hanging around, or some olives. I used up a goodly bunch of vegetables, and so tonight all I have to do is cook some carrots and wax beans and I'm home free. This farm share stuff can be work.